After the days of holly jolly and pretty packages all wrapped up with bows have passed, it’s time to move on to the days of eating, drinking, and being merry. And then the day of eating, drinking, and being hung over. For many, saying good riddance to 2016 and welcoming 2017 with open arms will be extra special this year. Because it’s crucial to lay a good foundation before really getting started on what’s known around here as amateur night for drinkers (i.e. folks who never go out trying to keep up with the folks that do), here are a few places to eat and drink on New Year’s Eve. Stay tuned for our New Year’s Day dining options to make sure you get lucky and get paid in 2017! New season, new flavors like our colorado rack of lamb, sweet potato gnocchi, and pan seared chilean sea bass. Our revamped dinner menu is now available as a 3-course prix fixe for $65 per person. The four-course menu at Trace at the W Austin offers enough options under each course that no one in your party will walk away unsatisfied. Enjoy your meal in the heart of the 2nd Street District before revelling downtown or heading upstairs to the W’s Neon Gold NYE party. Menu items include escargot, gulf shrimp bisque, kale strozapretti, lobster spanakopita, roasted rack of lamb, and tiramisu, among others. Dinner is $115 per person. Eberly is offering a couple of options for revelers, including dinner and/or a roaring ‘20s celebration. The dinner costs $125 per person and includes a four course prix fixe menu featuring items like oysters, black eyed peas with chicories, and wagyu strip (with vegetarian options), plus a glass of champagne. The celebration costs $100 per person and includes a ridiculous amount of fun (find out more at the event site). Dinner and the celebration combined will run you $200 per person. Gratuity and tax are included in all ticket prices and complimentary valet is available. Purchase tickets here, then contact [email protected] or call (512)916-9000 to book seating time for dinner. 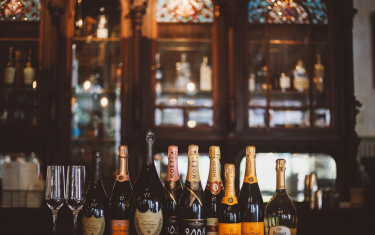 This New Year's Eve 2016, we're pouring out the bubbles all night long with a hosted bar menu from our sponsors Belvedere & Moet Hennesey. With flowing champaign, beer, and wine come dance the night away with the Gatsby Gang Jazz Band, Dj Men-Yo, Dj Jeff Strange, Rapt Aerial Dance and so much more. Tickets start at only $100 and are on sale now through the ?Link in Bio ? Enjoy dinner early so you can start drinking! Salt & Time’s NYE meat-heavy dinner starts at 5 p.m. and includes five courses and a champagne toast. First course: green salad full of goodness, second course: tartare taco, third course: chicken liver mousse. Main course includes choice of entree which is priced for the entire tasting menu: Akaushi filet mignon ($59 pp), Akaushi New York strip ($64 pp), dry aged Akaushi Porterhouse for 2 ($80 pp), red wattle porchetta ($42 pp), or grilled chicken thigh ($39 pp). Finish it off with choice of dessert: chocolate mousse with creme fraiche or apple and cheese tart with herb caramel. This affordable option can be found in the heart of the Warehouse District, giving diners the option to fan out to any other downtown entertainment districts afterward. This four-course meal runs $75 per person and includes an amuse of edamame hummus crostini, a 1st course that includes choices of poke, shrimp and grits, baby kale salad, and more. That’s followed by a main course with choices of pan seared snapper, chile relleno, ginger pork tenderloin, and more. And don’t forget dessert! They’re doing family style selections that include s’mores, smoked banana pudding, and yuzu tart. Make reservations here. Backbeat’s New Year’s Eve party lasts from 4 p.m. to 2 a.m. and will include a special limited cocktail menu with an emphasis on Champagne and whiskey drinks, plus large format punches available for groups of 4, 6 or 8. There will also be a prix fixe three-course small plates menu for $40 per person, as well as snacks, such as roasted olives, salumi boards, meatballs and chocolate. flights. Reservations are suggested. There is no cover before 9 p.m. After 9 p.m., entry is $20, which includes a Champagne toast at midnight. Make sure you’re there by 10 p.m. to watch the downtown fireworks display from Backbeat’s rooftop! If you’re looking for a truly unique evening, head to Eden East where guests can enjoy food by the fire or dine, relax, and eat a full meal to bring in the new year. This casual farm to table eatery is offering menu items like venison carpaccio, winter vegetable soup, roasted vegetable salad, braised Texas short ribs, and egg ravioli. And there’s not one but two best parts to this (besides the food): no reservation is required AND it’s BYOB so you can bring your own bottles to celebrate and keep your night affordable. This special dinner is also available on December 30 if you want to start celebrating really, really early. Another unique twist on the New Year’s feast can be found at Isla, where they’re serving up a Peruvian dinner with a midnight Pisco toast. The feast includes cebiche, skewers, miso frita, jalea (fried, lightly breaded tuna) and more. Find out more here. Jacoby’s wants you to count down to the new year for four whole days! Their special New Year’s Eve menu begins December 28 and runs through December 31. Find a variety of amazing southern, farm-inspired dishes like deviled eggs, grilled pimiento cheese, chicken fried steak, duck confit, and even a vegetarian “meatloaf.” Check out the full menu here.